THE ANNUAL Barbara Blackman festival blessing concert, named after the event’s most generous Turner, took an unusual turn this year when composer and RN music presenter Andy Ford hosted a mixed Q&A and concert on stage at the Gandel Hall in the National Gallery of Australia. On the platform with him were musician brothers James and Joseph Tawadros, ANU academic Raihan Ismail and Iranian-Australian visual artist Valamanesh. Throughout the afternoon, the Tawadros brothers played oud (Joseph) and percussion James), demonstrating that having been brought up in Australia had no obstacle to musical prowess. The participants lamented the fact that the present-day general public associates the Middle East with violence and Islamic insurgency. To Dr Ismail, the Middle East meant kind and generous, people, to Valamanesh it meant the flourishing of artistic creation, and to the two Ardross brothers it meant virtuosic music and sheer passion. Hovering in the background of the discussion all afternoon was the spirit of the legendary Egyptian singer Umm Kulthum, “the Edith Piaf of the Arab world,” as Dr Ismail explained. 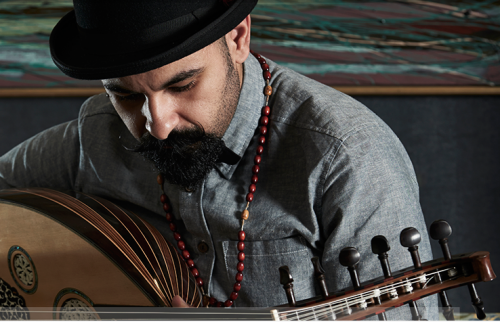 Joseph Tawadros, who is about to emigrate to England (moans of disapproval from the audience) was quick to point out that he and his brother came from a Coptic, not Islamic community, but admitted that the oud, “the king of all instruments” in the Arab world, had flowered under Islam in Egypt, though its origins went back in to that country’s ancient history and that of Iran. To conclude a challenging afternoon of thinking and listening, the Tawadros brothers took up their instruments again to play a work from the album “Permission to Evaporate”, finishing with a fiery, finger-destroying piece, “Forbidden Fruit” that well-illustrated James’ earlier contention that the Middle East meant passion.